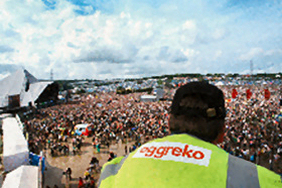 ADE supplies engineers services to Aggreko for the yearly event at Glastonbury. Aggreko had over 230 generators on site along with 90+ engineers to keep the music and lights on. A very low noise specification was required for this project as it is now providing stand by power at an all girl school in central London. 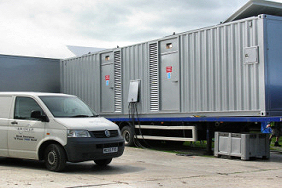 Power for the Mainstage at the BBC Radio Party in The Park annual festival is provided by two of these 75dB(A) @ 1m containerised generator systems. 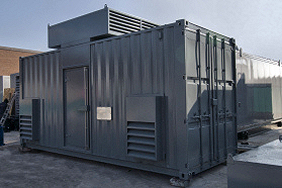 Each container houses 2 x 500kVA Cummins gen-sets. 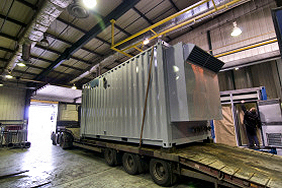 This canopied generator has a custom switchboard which will enable remote operation and remote connection to the generator. 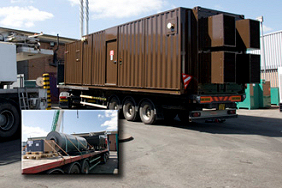 The first generator to leave ADE this month is another gas generator, this time painted brown. The roof mounted silencer and radiator can be seen inset on a seperate transport. 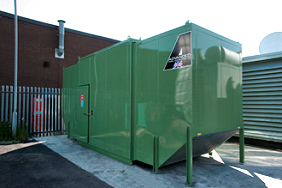 This unit is now on site in Ireland. 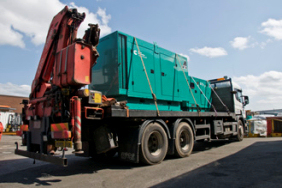 The last generator to leave ADE this month is another gas generator, this time painted green. 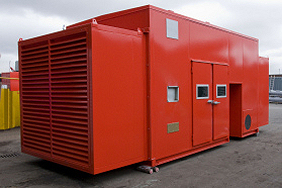 This unit is now on site in Ireland. 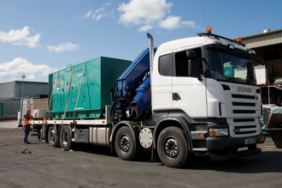 Two more 40' gas generators leave ADE. These generators have the same spec as the ones leaving in February. 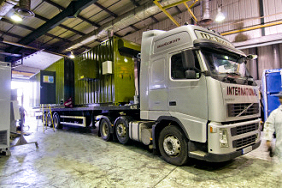 Again they will be powered using natural gas from waste sites across the UK. Another Cummins canopy leaves ADE... We hold many items of stock in the Cummins generator range, please see our stock list here for more details. 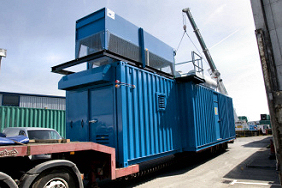 Number 9 of 37 gas powered generator containers leaving ADE. 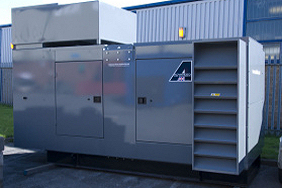 These silenced generators will be used to power various installations belonging to one of the UK's leading supermarkets. This strange looking Cummins canopy is a standard unit which has been modified to drop the noise levels by a further 10dB(A) from the standard specification. It is now providing stand by power for a Midlands water authority. These custom designed and built canopies are to house large pumps powered by CAT generators. Due to a quick release CO2 system inside these units they are specified 'air tight' to ensure no leakage of the poisonous CO2 if it was necessary to discharge due to a fire inside. 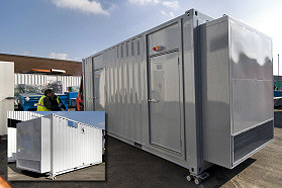 1 of 37 gas powered generator containers complete and ready to ship. We will be shipping one of these every week for the next 36 weeks. 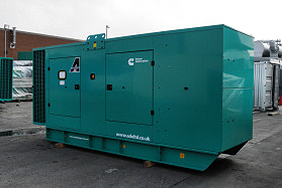 These silenced generators will be used to power various installations belonging to one of the UK's leading supermarkets. 1 of 2 acoustic canopies built to house rotary converters. These will be used at various underground sites in the UK. These units will be used to convert a supply of 400 volts, 50hertz, 3 phase to an output of 100 volts, 125hertz, 2 phase. A repeat order for two more 2500kVA generators housed under drop over canopies are being dismantled for shipment in the yard area.